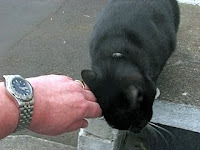 The Curious Case of The Cat and The Man In Black | Mike Hitchen Online: Mike Hitchen Unleashed - telling it like it is! Last month I described my encounter with a black cat that has taken a liking to my apartment building. Despite telling her of my reluctance to allow her to sit on her haunches right outside my front door, we have remained on good terms. In fact, as this photo taken a while ago shows, she is quite comfortable in my company. However, the last week, things have changed. She has started running away from me! "I' don't bloody blame her" I can hear some cry, but it's not quite as simple as that. There is a pattern to her aversion. She will only run away if I am wearing black! Whenever I wear another color, she will look at me and sidle up to my leg. However, if I am wearing black trousers, a black shirt or a black jacket - she will look, then run! I really don't need a feline fashion critic hanging around my apartment!